The day begins showery. At an early hour this morning the Tauranga arrives at Auckland from the Thames with 1,515 oz 15 dwt of gold, to be shipped on board the barque Novelty later today for dispatch to the mint at Sydney. Of this amount the Bank of New Zealand contributed 600 oz and the Bank of Australasia 300 oz. New machinery is being designed for the Thames Crushing Company for erection on the Moanataiari Creek where the ground is being already prepared. This machinery will drive 40 head of stampers and to the efficiency of the crushing power will be added every convenience and improvement known for the effective operation of the amalgam by which elimination may take place without loss or waste. The building in which the machinery is to be enclosed will be up in a week or two and measures 86 ft by 32 ft and will contain the whole of the machinery under one roof. The machinery will be driven on a high pressure engine of 35 horse power. The engine and machinery were made at Norman’s Broomhill Foundry, Glasgow, and the stampers are supplied by Langland’s Foundry, Melbourne. The whole of the machinery will be here in the course of three weeks and the cost of construction - building and machinery – is estimated to be about £3,500. 00. In addition to the numerous machines that are now in place for crushing Thames quartz it is anticipated many more will arrive before the summer, and when summer does arrive a busy and profitable season for the gold miners is expected. 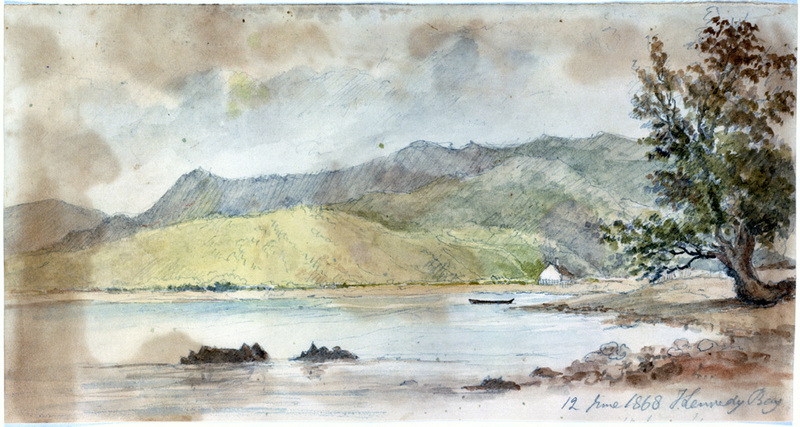 It is confidently thought that in the course of a few weeks – two months at the outside – the necessity which exists at the Thames for increased crushing power will be met by the introduction of machinery upon a scale adequate to the wants of the mining population ending complaints that the Auckland capitalists do not take an interest in the development of wealth at the goldfields. At Auckland the steamers Midge and Tauranga are hauled from the wharf and anchored leeward of it for the day, no passengers for the Thames having put in an appearance. The weather deteriorates and the barque Novelty, laden with Thames gold, delays her departure from Auckland for Sydney until tomorrow. This afternoon the remains of the late J Wilson, storekeeper at Shortland, who died on Tuesday, are buried. Having been a member of the Naval Volunteers it was determined to give him a military funeral. The coffin is placed upon a gun carriage, covered with the Union Jack and headed by the Naval and Rifle Corps bands, the melancholy cortege moves up Queen Street, Karangahape Road and onto the cemetery. At the Thames a very severe gale of wind accompanied with heavy rain from the NE starts to blow in and increases in violence. The wind passes over in furious gusts, tearing down numerous tents in which the miners and their families are preparing to rest for the night. Frequent heavy squalls of rain, as well as the wind, make re-erection impossible so the unfortunate occupants take refuge with their neighbours who are lucky enough to possess a weatherboard building, or whose tent can withstand the violence of the tempest. In some instances the tents are sent rocket-like into the air and in others razed instantaneously to the ground to the surprise of the occupants. At Waiotahi, a large weatherboard building in the course of construction for Mr Ledyard is literally blown to pieces by the force of the wind. The building, which was 46 ft long, had been completed with the exception of the shingling. On the Karaka a dwelling house is lifted off the blocks and deposited a short distance away. At Shortland portions of galvanised iron roofing and loose timbers are flying about in all directions, rendering the streets dangerous to pedestrians, the ‘streets’ now being just streams of mud. The gale is also felt severely at Tapu – a number of tents are blown to ribbons and one or two half built buildings are blown down. Inhabitants of the wrecked tents, with difficulty, make their way through the pitchy darkness to the safety of the hotels. The schooner Julia and the cutter Mary Ann which have just finished discharging their cargos, are driven ashore. The Mary Ann succeeds in getting off again without much trouble, but the Julia lies high up on the sand. The Enterprise returns to Auckland after a tempestuous passage. It is one of the severest storms experienced at the Thames. At the Thames and Tapu this morning the canvas dwellings present a very doleful appearance. Great numbers of tents are blown down in all directions and many others are torn to shreds, Scattered provisions and clothing have been left to the fury of the storm, and blankets and garments are picked up and hung out. At Tapu provisions in most instances have been spoiled or devoured by the pigs and dogs with which the place abounds. These brutes cause much mischief forcing their ways into tents by day and night. Luckily for the vessels lying at Tapu the wind was from the land, had it been otherwise, those beached in front of Sceats’ hotel would have sustained severe damage. In the commercial sector the fine weather which has prevailed during the early part of the week has given a tone of animation to trade. Rumours have been prevalent of new gold discoveries, both north and south of Auckland, at present however they can only be looked upon as rumours, and as such are worthy of little attention. Meanwhile the working of the Thames district progresses slowly but surely, several remarkably rich yields having been recorded during the week. In consequence of the non-arrival of any vessel with a general cargo, the prices of most articles have remained firm. A considerable quantity of inferior beer is in the market, believed to be quite unsalable. There has arrived in town several parcels of really good provincial bacon. Price’s Belmont sperm candles are always more saleable than any other brand, however very few are offering them at the moment. Raisins are becoming scarce. Drapery, pending the arrival of the Racehorse, remains scarce. The arrival of several large shipments of 2,280 bushels of wheat from the south has rendered the breadstuffs market firm. Biscuits are now very dull of sale. Messers L D Nathan and Co held a sale of oilman’s stores, groceries etc which included soap (Primrose, household blue mottles and best pale yellow), Reynolds purified prepared clay pipes, Coleman’s mustard, dried apples and Melbourne-made oatmeal. At Tapu the Julia’s ballast is thrown overboard but this does not help float her. Another attempt will be made on Monday morning and if unsuccessful, she will probably remain there for some time. At the Thames a large marquee, the property of Mr McDonald, is carried away. The marquee blew down in the recent storm and although it required three men to lift it into a dray when packed, the thieves appear to have made a clean sweep of it when saturated with rain, without anyone detecting them. The poles, ropes and other fittings are also carried off. The latest news from Kennedy’s Bay is of a more satisfactory character. Mr T Macready comes up from there today to Auckland bearing a small parcel of about 1 oz gold of apparently superior quality to that of the Thames. It resembles very much that of pure metal. There are also several nuggets as large as a common pea. Other nuggets have been found by other diggers, and reefs abound but have not been found to be auriferous. Diggers are constantly passing through Coromandel and back again to the Thames. They are found to be chiefly well-to-do shareholders at Shortland who do not care to commence prospecting at Kennedy’s Bay during winter. It is very unfortunate that the place was not opened sooner as this is evidently the wrong time of year to proclaim new diggings. The drops before the shower. There is considerable briskness in sales of mining shares and speculators are awakening to a sense of the extent and importance of the Thames field for mining enterprise. Eighty five miners have arrived from the West Coast in steamers coming into the Manukau during the week, and a much larger number are reported to be following in another vessel. 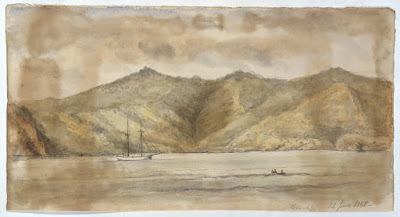 The Thames population will very speedily receive an accession of nearly 1,000 miners from the West Coast alone, while the skilled practical men in the Australian colonies are directing their attention to the same field, and may be expected to follow the example of the West Coast miners before many weeks elapse. An instalment of capital for investment has been received during the week and money has been judiciously placed in the interests of the capitalists. A sale this week effected in a claim at the rate of £800 per share, whilst ten days ago the same interest changed hands at £300 per share - this is only one of numberless similar instances. New machinery is on its way from Melbourne for the Thames Crushing Co which will see a vast improvement in the yield of quartz. It has been made expressly to the order of James Cruikshank, who, as their agent, visited the principal machines at work in the Melbourne district, and received the advice of practical men. The works at Clunes, which are considered the most efficient in Australia, have been taken as a model and improved upon. These are merely the drops before the shower, before many months elapse it is expected a large amount will find its way into the hands of trustworthy agents for investment in the Thames goldfield.. The ss Beautiful Star sails today from Wellington with a number of miners bound for the Thames goldfields. A miner named William Seymour is passing along the corner of Willoughby Street, near the Bendigo Hotel, when he is stuck up by a person who seizes him from behind and robs him of an open-faced gold watch, marked 'Chadwick, Liverpool', a gold watch guard, a magnifying glass, memorandum of accounts of the Bobbie Burns and Lucky Hit claims, a £1 note, some silver, a morocco cigar case containing spectacles, a miner's right (number 306) and a pocket book. Andrew Hevey is also robbed this evening at the Bendigo Hotel of one escapement watch, one gold guard, half a sovereign, some silver, a meerschaum pipe, four £1 notes, a large size magnifying glass and agreements. Andrew is somewhat the worse for liquor and the robbery is committed after he leaves the hotel. Saturday evening brawls at the Thames are a great annoyance to the peaceful inhabitants. No less than 12 fights have recently been reported to the police sergeant on one night. The cause to some extent is attributable to the insufficiency of the police force, which consists of four constables and a sergeant to a mining population of some 8,000 souls, which is increasing. Yesterday two constables were dispatched by steamer to Auckland in charge of a dangerous lunatic leaving two men to do duty in Shortland and one at Waiotahi – not enough. The time of constables is greatly occupied with summonses and other duties arising out of the Warden’s Court, so that at least six constables could be fully employed in Shortland and two at Waiotahi. There is concern that it will be necessary for those who have to be out after nightfall to carry with them weapons of defence. A gentleman who recently had occasion to go from the Waiotahi to Shortland was accosted by a rough looking fellow, but on presenting a small saw, which, in the dark looked much like a short sword, the fellow decamped. The lodgers at the West Coast Boarding House, kept by Mrs Mounce, are unceremoniously deprived of their breakfast this morning, when a hungry imposter sits down at the table as soon as the food is served and does not rise until he has completely devoured 12 men’s breakfasts. The man is worse for liquor and on being remonstrated for his gluttony, attacks a man named Nolan with a knife, inflicting a small wound. The Reverend Thomas Norrie, of Papakura, conducts divine service in the new Presbyterian church at Shortland this morning. The Airedale arrives at Auckland from the South Island bringing up some 40 miners for the Thames. A strong gale from the NE prevails throughout the day at Auckland, accompanied by heavy rain, and the steamers Tauranga and Enterprise for the Thames and several small sailing craft are unable to leave the harbour. The schooner Rose Ann puts in through stress of weather. She is from the Thames, bound for Great Barrier. This afternoon the Reverend Norrie again preaches – this time at Mr Skeen’s schoolroom, Waiotahi. Reverend Norrie holds divine service this evening. The attendance is very good and very excellent discourses are delivered. Stormy weather sets in this evening at the Thames. A gale sweeps in accompanied by very heavy rain, from the north east. The schooner Julia, which was laid high and dry in Tapu Creek during the gale of the 11th, is floated off successfully today, despite more deteriorating weather. 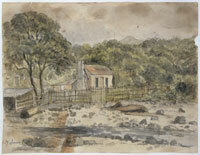 Jamieson and party, Tapu, open a new claim on the Big Creek, and obtain the satisfactory prospect of 2 dwts to the dish. The Falls of Niagara, a new claim opened by Messrs Sceats and Co, on the hill in rear of the British Hotel, also get a good prospect and numerous claims are pegged out. Trade at Tapu seems to be improving and it is rumoured that the ss Halcyon is to be laid on regularly. The West Coast boarding house glutton is brought before Alan Baillie JP for his punishment as a drunkard. Nolan declines to prosecute on the graver charge of cutting and wounding. The Golden Cup claim (late New-Found-Out) situated on the Waiotahi, consisting of six men’s ground, which opened about seven months ago, has been turning out some magnificent patches of golden quartz during the last few days. The Pai Maire claim, comprising three men’s ground and opened about six months ago, has been abandoned by no less than five different parties – gold has only been discovered during the past three months and is now taken out in very satisfactory quantities. The present holders are not so easily led away and appear to have commenced operations at the proper spot. Sully and Wardell’s sharemarket report notes that owing to many causes, the share market is decidedly dull. They strongly advise those miners who can manage to hold on to their claims to do so, for the majority will be amply repaid in the spring for trials endured during the winter. A good many claims on the Hape and Karaka creeks are turning out very good quartz. Magnificent specimens are to be seen at Sully and Wardell's office taken from the Lucky Hit claim. From Tapu favourable accounts are daily being received, but many claim holders are compelled to sell shares in first class claims for want of funds. The great drawback to the full development of these districts is the absence of machinery. At the Police Court, Shortland, George Roberts is brought up charged with stealing one butcher’s steel, value 5s, the property of William Rae, of the Mundic Reef store, yesterday morning. The offence having been proved, the prisoner is ordered to undergo one week’s imprisonment with hard labour. John Boyce is brought up charged with stealing £5 and an agreement of £20, the property of William Wilson, on board the steamer Tauranga on her passage to Shortland, on Friday last. Boyce is remanded for the production of witnesses, who were on board the steamer at the time of the occurrence. A pony race between animals owned by Mr Mulligan, of the Governor Bowen Hotel, Waiotahi, and Mr Wilson, pound keeper, for £10 a side, is held on the Flat today and results in a victory for the latter. The race is closely contested throughout and the stakes will be doubled for a second event in a few days. The 23rd session of the Auckland Provincial Council is opened today. Superintendent Williamson delivers his usual opening speech. He admits to having failed to accomplish as much as he desired but hopes to be able to effect a great deal in the future, relying on brighter and brighter prospects, restored confidence among the commercial and trading classes and the development of the Thames goldfield. He looks to the Thames goldfield to better the conditions of the Province, but concedes they have done little for it yet. He regrets that he has not been able to spend an adequate sum on public works on the goldfields, as the General Government have impounded the gold duty, amounting to £2,334. He also informs the council that it will be invited to make provision for neglected and criminal children, and destitute persons, and for a lunatic asylum and hospital, by means of a rate. The Midge is laid up for a thorough overhaul. Her cabin will also be enlarged and she will be fitted with every comfort and convenience for the cabin and steerage passengers. The steamer Halcyon makes her maiden trip to the Thames today. She is a very pretty little steamer which behaves remarkably during stormy weather at sea. The Halcyon will prove a formidable rival to the other Thames traders. When leaving today in a hard gale she was intently observed by several spectators, and her qualities as a sea boat and her style of tripping through the water are undoubtedly very superior. She was well filled with passengers – a good omen for the prosperity of her owners in their new enterprise. During the day at Tapu tents are blown down, many which stood well during the gale of the 11th succumb to this one. The creek swells to such an extent that communication with the two sides is entirely cut off except by means of boats. All mining enterprise stops. A party of men, whose combined judgement and skill are not equal to their pluck, leave Tapu at the height of the gale for Shortland in a whaleboat. They don’t get very far however before they find it necessary to put about for the beach. They all succeed in reaching the shore in safety, but the boat is speedily broken up by the fury of the surf. Tonight the gale which has been intensifying all day veers round to the northwest and reaches its peak. The creek at Tapu becomes a large river, overflowing its banks in many places and carrying down with it large quantities of debris and washing away a large portion of the roadway. The tide is at its highest also about the middle of tonight which increases considerably the volume of water in the creek. A family residing on the bank of the tidal portion of the creek are placed in considerable jeopardy. The water is two feet high in their frail canvas tent. The Clyde is driven from her moorings a short distance downstream, and the yachts Rosalie and Huntress drift onto the spit, where they are secured and have a narrow escape from destruction, the beach there being very stony with a heavy sea rolling in. A considerable portion of the bank near the landing place is washed away and the landing place itself, which is composed of large logs, almost entirely disappears. The channel is fouled by a large number of tree branches which will prevent the ingress or egress of any craft except small boats. Landslips at the Thames and Tapu are numerous – a great deal of land is loosened also and may fall at any moment. The slips about the claims are chiefly at the face of the drives, it is here that the crushing stuff from the leaders is kept. These slips may cause a great loss eventually of ready money, as well as present labour, the heavy rain having washed a great deal of worthless rubbish into the heaps of selected crushing stuff. Several trees of a large size have come down with the earth, completely blocking up the way. A number of men are engaged today in clearing the rubble away. Rumours surface that gold has been found in the neighbourhood of Rangiriri. For the last two or three years there have been intermittent rumours to this effect but the reports invariably die away. However, now actual specimens of gold bearing quartz have been seen by a favoured few and the exact locality made known to be near Lake Waikare. Other recent discoveries of gold have been made at Te Arai Point, Wellsford; Newton and the Whau (present day Avondale); suburbs of Auckland; at the Wade (present day Silverdale) and at the Wairoa, Kaipara. A frog is found alive in one of the drives on the Karaka Creek. It is left for exhibition at the shop of Messrs Spencer and Co, chemists, Willoughby Street. The Inspector of Sheep notes in his report that exports have diminished materially within the last 12 months, and although there is now a prospect of fat sheep being in demand in the Auckland market for the Thames diggings, there may not be that many sheep in the province in sufficiently good condition to take advantage of it. “Sir – Having noted in your paper a general desire to get justice for miners when they make their grievance known . . . I think we are very badly treated here by the Post Office authorities, who have sent a person as postmaster to Shortland to humbug us miners. They do not seem to think it is sufficient to prevent us receiving our letters except on Saturdays, as they have effectually done by keeping the office open only from 9 to 5, during which hours not one miner out of 50 can call for letters, but even when we do come on Saturday afternoon the postmaster will not take the trouble to look for them or give them to us, but tell us “nothing for you.” But to give you a case in point I was anxiously expecting a letter of importance from Auckland about the 1st of last month. Well, sir, as I happen to be a working miner and live far back in the ranges, I could not call for letters except on a Saturday, so I called for this letter on three consecutive Saturdays and got the stereotyped answer “There are none.” I got an opportunity of sending an order during the time, when, lo! I received my long expected letter bearing the Auckland post mark of May 1st and the Shortland postmark of May 2nd, which clearly showed that it must have lain from that date until the 17th which was the day I received it. Now, Sir, I ask you – is this to be borne or have I no remedy. I have lost seriously by not receiving that letter in due time, and would like to know can I make the postmaster make good my loss. A MINER." Private letters from the West Coast and Melbourne suggest that there is quite an excitement at these places over the Thames goldfields. At the West Coast it is said that there are some hundreds of diggers preparing for a start for the Thames, while at Melbourne there are not less than 800 who intend at once to give the goldfield a fair trial. An extensive mosquito steam fleet at Auckland now plies the waters. Eighteen months ago there was but a single steamer on the Waitemata. There are now, or will be, no less than 14 steam boats of about 500 nominal horsepower belonging to Auckland port. Whatever depression which has been suffered from, this does not look like collapse, as there is also the finest mosquito fleet under canvas in the colony, which is almost as large as that of the rest of the province put together. The Thames trade has had much to do with this, as well as the Bay of Islands coal fields having been opened. Steamers are now able to obtain a better quality of coal, at a lower price, the saving in burning Bay of Islands coal over Newcastle being very considerable. This evening five pairs of boots are stolen from the new store opened by Mr Levy. The roads between Shortland and Tookey’s Flat are almost impassable. If the government would lay out £10 and put a footbridge at the mouth of the Karaka Creek, a good road could be had along the beach. The engines and machinery come down from Auckland today for the Shotover battery – the machine is expected to be at work in about a fortnight. While excavating for a kiln, the party strike a new leader, very rich, about 9” in thickness. A meeting of the Thames Crushing Company is held today at their office, Canada Buildings, Auckland, at which 15 shareholders are present. The site for machinery has been completed and ready for the construction of the necessary buildings, the excavating work has been executed in a most satisfactory manner, but the roads are at present impassable for the transit of heavy machinery. Stone from the Bobby Burns claim, Karaka Creek, forwarded to Melbourne for the purpose of being experimented on, has been carefully analysed, and the results show a marked increase in the yield of gold when properly crushed and treated with hot water and sodium. The company’s machinery, with patent steam ripples, will be a very great acquisition to the goldfields and promises to be remunerative to shareholders and employers. The fine little steamer Halcyon arrives in Auckland harbour this evening from the Thames. She made the passage in four hours 15 minutes. It is Captain Wing's intention to proceed right up to the creek in Shortland in future, and land his passengers at the town. The Tauranga and Halcyon have proved themselves very equally matched; the Halcyon had 25 minutes start today and maintained it undiminished throughout the passage. There is at present quite a dearth of coal in Auckland. Messrs Henderson and Macfarlane advertise for vessels to bring coals from the Bay of Islands. Thames steamers are experiencing great difficulty in supplying themselves.